Pad mini and 4th gen iPad are up for pre order on the 26th. WiFi versions ship on November 2nd. 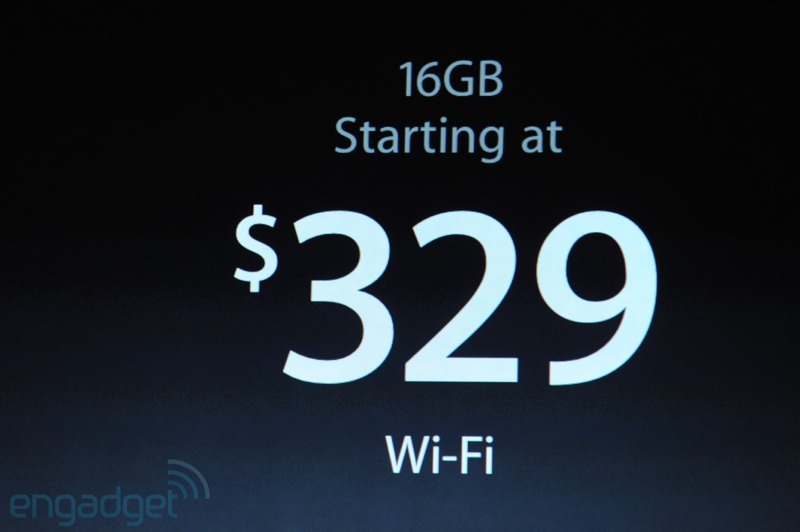 16GB is the smallest configuration with WiFi, priced at $329. 32GB mini is $429, 64GB for $519. $130 each additional for LTE connectivity. LTE wireless and the new dual-band 802.11a/b/g/n WiFi and, of course, a Lightning connector. 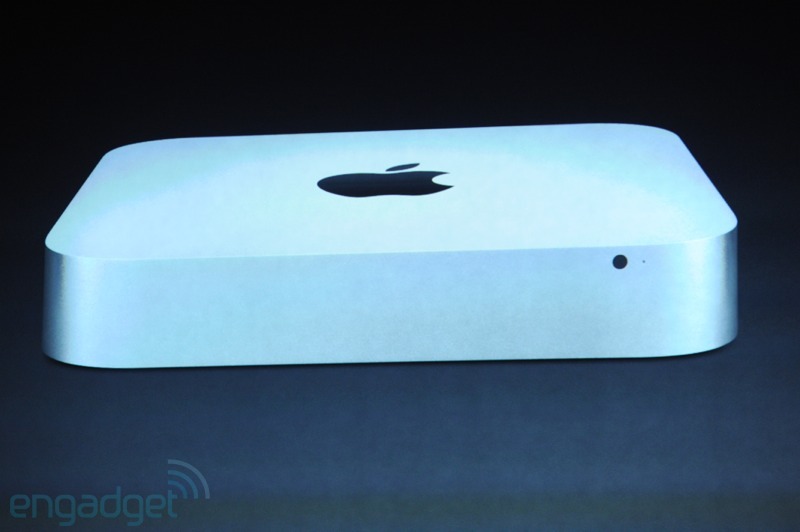 FaceTime HD camera and 5-megapixel iSight camera on the back with 1080p recording. 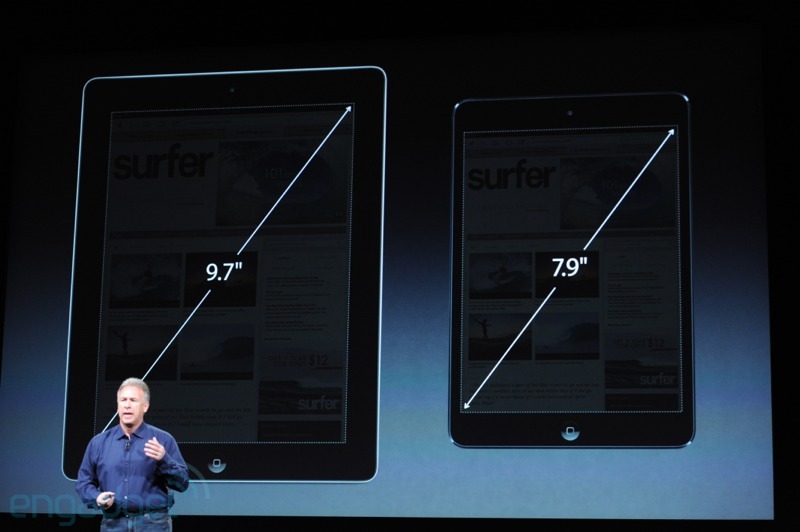 iPad 2 is 9.7 inches, iPad mini is 7.9. 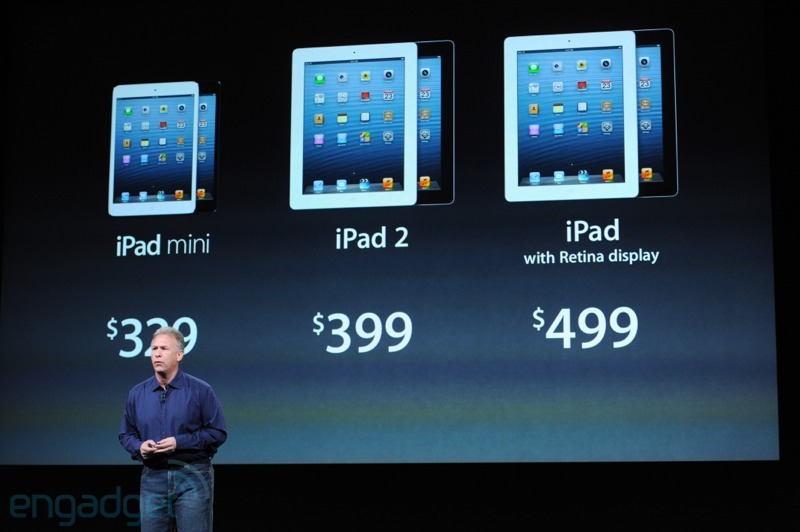 Exact same resolution as the iPad 2. 1,024 x 768. So, no work for developers at all! Black and white, the black model having the same anodization as the iPhone 5. .68 pounds, half as light as a fouth-gen iPad. As light as a legal notepad. 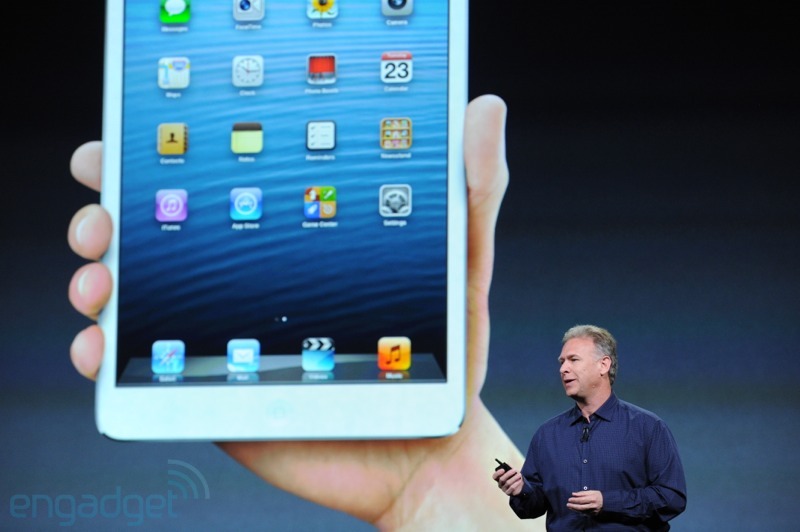 It’s 7.2mm thick, 1/4 thicker than the fourth-gen iPad. That’s as thin as a pencil. What can you do with this iPad which you can do with the others? Hold it in one hand!! 16GB Cellular model starts at $629, as before. 4th gen iPad are up for pre order on the 26th. WiFi versions ship on November 2nd. 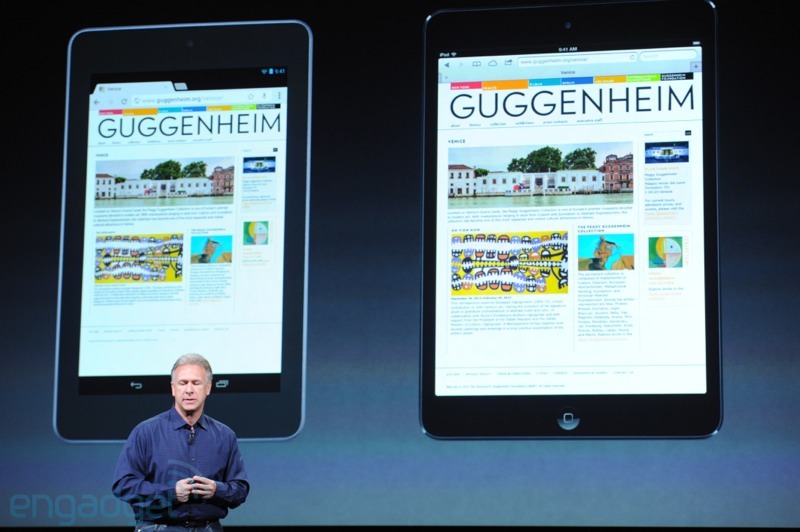 And there’s the new Retina display, of course. Finally, here’s the new camera connectors, for SD reading, as well as USB, HDMI and VGA adapters. 802.11a/b/g/n dual-band WiFi, and there’s a Lightning connector, of course. Flash Drive + Hard Drive in one. Aperture imports are 3.5x faster using flash vs. HDD. In this FusionDrive it’s very nearly as fast as a pure SSD system. 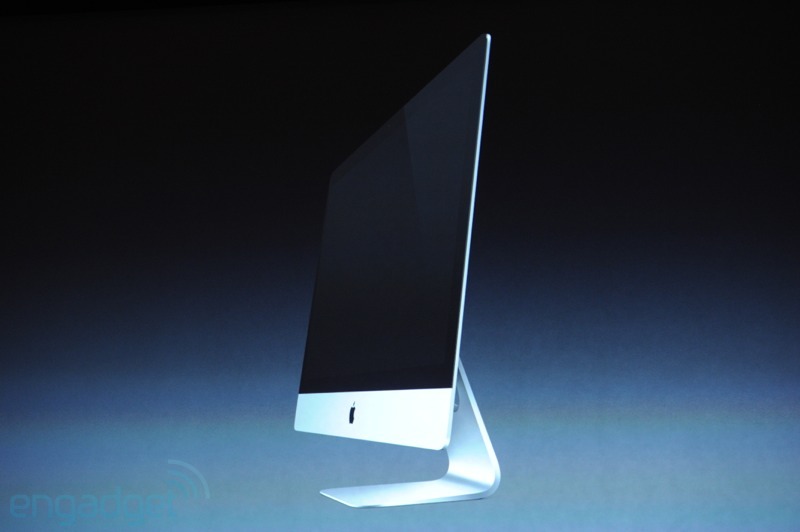 The 27-inch model starts with a 2.9GHz i5, 8GB of RAM and 1TB HDD for $1,799, shipping in December. Base, 21.5-inch model is $1,299 with a 2.7GHz i5 with 1TB HDD and 8GB of RAM, shipping in November. It’s a single, logical volume that delivers faster reads and writes as well as massive storage. You can now choose what Apple is calling a Fusion Drive. 128GB of flash storage mixed with 1 or 3GB HDD. Four USB 3.0 ports, three Thunderbolt ports. We’re looking at the inside now. Core i5 or i7 processors, NVIDIA Kepler graphics, up to 768GB of flash or 3TB HDD, and 32GB of RAM. 720p FaceTime HD camera, dual mics, dual speakers. It’s eight pounds lighter than before, for the 27-incher we presume. 21.5-inch and 27-inch. 1,920 x 1,080 and 2,560 x 1,440 for the two sizes. It’s 5mm thin at the edges. There’s a server model, 2.3GHz Core i7 with 4GB of RAM and dual 1TB HDDs for $999. 2.5GHz spec with 4GB of RAM and 500GB HDD for $599. Four USB 3.0 ports, SD card reader, HDMI… and now we’re looking inside. Core i5 or i7 ivy Bridge chips, up to 16GB of RAM and up to 1TB HDD or 256GB of SSD. $1,699 for the base model, with a 2.5GHz i5, 8GB of RAM and 128GB of flash – Ships today! The higher-spec 13-inch model starts at $1,999. We’re guessing that’s a 2.9GHz Core i7, but we’ll wait and see about that. Phil says you can expect up to 7 hours of battery life. Up to 768GB of flash, 8GB of RAM, Core i5 or i7 Ivy Bridge chips, 802.11n WiFi and Bluetooth 4. HD 4000 graphics. Facetime HD camera with 720p recording, stereo mics and speakers, backlit keyboard and of course that patented glass multitouch trackpad. “Everything on it is absolutely gorgeous.” 2,560 x 1,600 resolution. That’s a 4x boost over the previous 13-incher. MagSafe 2, dual Thunderbolts, SD card, HDMI output and dual USB 3.0. No optical drive, of course, and yes, a Retina display. 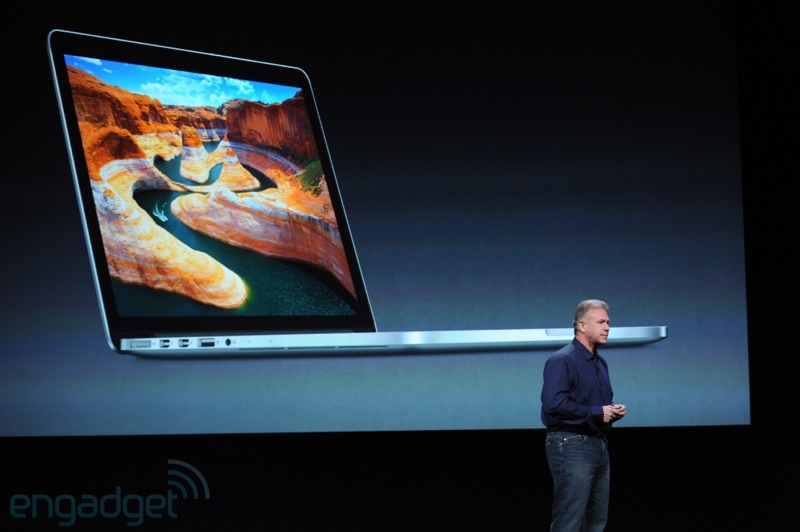 Weighs 3.5 pounds, about a full pound lighter than before, and the lightest MacBook ever. 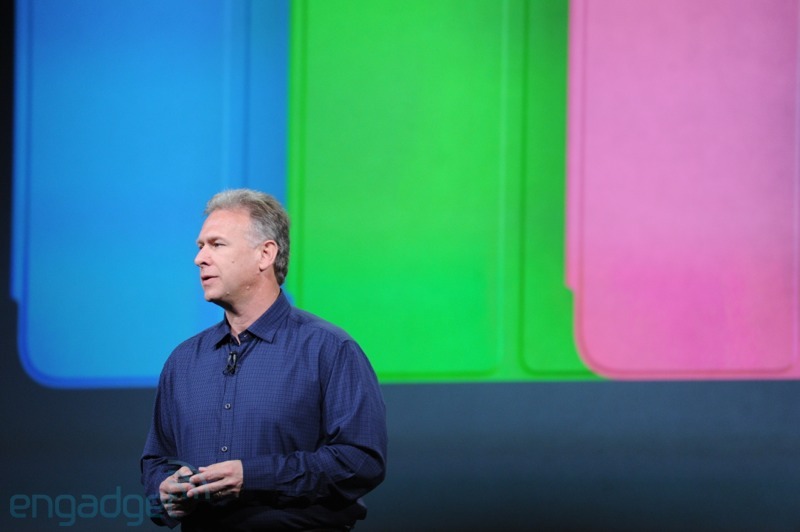 “It is incredibly thin, just .75-inches thick.” That’s 20% thinner than before. That new version is available today! iBookstore now. 1.5 million books available, and 400 million downloads to date. It’s iCloud integrated, so your reading position syncs wirelessly to all devices. You can post excerpts to Twitter and Facebook if you like, and 40 languages are supported. We’re seeing Korean, Japanese and Chinese script. Tim’s reciting the same numbers we saw before, 700,000 iOS apps and 275,000 iPad-specific ones. “Customers absolutely love the selection in the App Store and we’ve reached another milestone.” 35 million apps have been downloaded! “This is great for customers. They get the choice of some fantastic apps, but it’s also great for developers.” $6.5 billion paid out. This entry was posted in Media and tagged App Store, Apple, iBooks, iMac, iPad, iPad 3, iPad 4, iPad Mini, Mac Mini, MacBook, MacBook Pro, MacBook Pro 13 inch, Media Event. Bookmark the permalink.